Click on any picture to see it full size. Then use the left and right arrows to see each one. Here are all the first ten entries for the “Make It Work” Challenge. See this page for details of the challenge. While visiting my daughter’s family, typically we catch up while folding laundry. She has a separate basket with a lot of single socks missing their mates. This was my inspiration. Machine pieced and quilted and hand appliquéd by participant. Noted by participant: the yellow circles are soap bubbles. In the 70s my mother made many cross-stitch tablecloths. They were well used for many years by me and my family. This will be a great remembrance for me and for her grandchildren. I have so many pieces, scraps, and articles of clothing that had been my mother’s as well as my own stuff I couldn’t bear to part with that it was difficult to decide what to use for this challenge. However, in my closet I have a v-neck sweater of my mom’s that has a peacock with its head peeking into the neckline. This always made me laugh. Then I remembered a much loved and cherished skirt of mine with bright colored paisley designs, and the idea of a peacock quilt was born. It wasn’t emotionally easy for me, but I managed to cut up the skirt’s paisley motifs to use as the peacock’s tail. The body is from a silk blouse of mine, and the peacock’s crown was made using a motif cut from my mom’s beloved sundress. That was also hard to cut up. The wings and facial features were made using fabric from my stash. My apologies to singer Brad Paisley for the play on words in the title. I just thought the bright colors in this piece were pretty “rad,” or radical, and there is, after all, lots of paisley! Machine appliquéd and machine quilted by participant. As I was working on this mini quilt, I found that all the pieces I used were from quilts I had made. Two especially brought back fond memories. When the book, Quiltmaker’s Gift, came out, I loved the book and the blocks that were featured in the book. Making these blocks looked like a fun project, and Benartex fabrics came out with a whole line complementing the blocks and story. Using this fabric, I made all the blocks in the book and put them in a quilt. 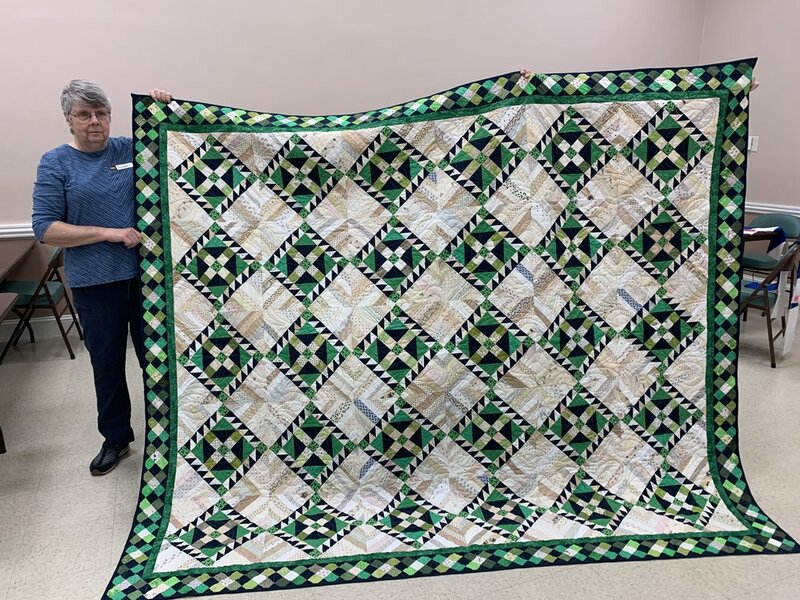 At this time, I belonged to the NJ State quilting Guild and they were starting a program to visit 4th and 5th grades in schools to explain quilting and its connection to shapes and design. I donated this quilt to their project. That Fall I found out that this quilt was shown at the quilt show in Houston. 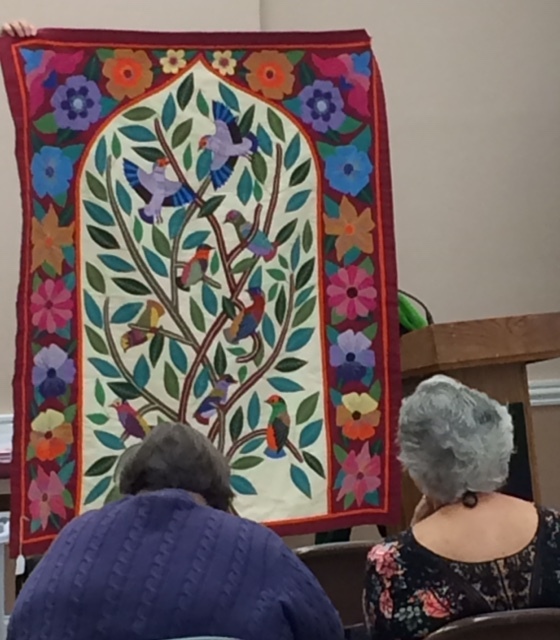 Our GCQG member, Jane Hill, saw it there and remembered it because she is the one who quilted it! The other quilt I still had scraps from was an African quilt design I made after my husband and I returned from a wonderful trip to Africa in 1998. I made this quilt on our winter visit to Florida in 1999 and I still have it. This entry won Viewer’s Choice. The first thing I thought of for this challenge was the many crocheted and tatted lace doilies that I have saved for many years because I couldn’t bear to throw them away. The tatting was done by my maternal great grandmother and the crocheted lace by my maternal grandmother. It took a while to convince myself to cut them up but, when I realized I was never going to use them, these laces became the inspiration for my crazy quilt sampler. Working on this challenge gave me a new appreciation of the time and labor that ladies spent creating this type of quilt. On the back of each block is an example of several of the original doilies. I have a love-hate relationship with challenges. First, I groan. Then, I am energized by the spark of an idea. The next step is the process, which is never a straightforward, well-thought-out, start-to-finish plan for me. More like fits and starts and undoing. But ultimately, before the deadline, something unique emerges. Good or bad, it is an expression of my particular talents, interests, and experiences. This year I undertook a major downsizing in my living arrangements. So many items of cherished but outdated, not-worn-for-years clothing were on the verge of being eliminated. Then, along came the challenge, and I was able to keep a compact version of my memories. Thanks for the opportunity. Machine pieced, quilted, and hand appliquéd by participant. Embroidery and silk ribbon embroidery done as well. It seems that never throwing anything away has its advantages. I started with a painted canvas from a class many years ago just waiting to be completed. Then there was the year my husband the bride in a mock wedding and I made him a wedding gown from lace curtains donated by a friend. And there are always baggies from the morning paper, plastic bags from fancy shops, fruit net bags and mailing envelopes stashed away. A little tulle and some fancy stitches on the machine and voila! Nothing bought; everything collected. FUN! So many classes…. I painted I dyed, I printed, I stamped, I transformed plain fabric. All the fabric in this piece was created during or after classes. The hand appliquéd painted owl was trapuntoed so it would seem as if it was in flight. I was gifted a box of old linens from my neighbor, Ausma Merrill, prior to her going to an assisted living facility. I decided to use the sheets and made quilts for each of my daughters. It was a “thank you” to the woman who introduced me to quilting and she is the inspiration behind my challenge quilt! I took the ribbon-embroidered bed topper that my Gramma Bessie made in about 1919 for her trousseau. I found some old- fashioned looking floral tone-on-tone fabric for the back, used a wool batting, and a beige fabric as the top. I basted all three layers together and then machine appliquéd Gramma’s quilt topper to this quilt. After I sewed around each flower petal, leaf, and ribbon, I echo-quilted the entire quilt. I trimmed the topper down (it was double bed size) and finished the quilt with a wavy border. My mother kept the topper for many years, displaying it on her bed when she had company. She gave it to me about 4 years before her death and I kept it in my closet. With this Challenge, I finally knew how to honor my grandmother’s memory – and my mother’s as well. It will hang on my wall as you enter my home. Patch Reef Park again invited us to display some of our quilts in their windows. Quilts from the Fifty Shades Challenge and the Mask-erade Challenge were selected for the display and hung by Ilona Farnes, Carol Stoltenberg, Sarah Crew and Elona’s husband, Jim.